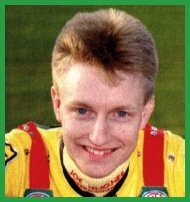 Gert joined Cradley in 1988 on the recommendation of Kristian Praestbro after only one complete season in the Danish League but he had already won the Danish Junior Championship. He came to Cradley as a shy lad who spoke very little English but he came to the right place with Erik & Jan O to help to settle him in. Gert struggled at first with many engine problems; being relegated to reserve in May, it was a difficult start for him, a long way from home, big debts trying to sort out his mechanical gremlins but he still managed to average over five points a match and was an automatic choice for 1989. He began his second season quite well partnering Erik but then went into a decline and ended up at reserve with the arrival of Greg Hancock, it was enough to spark some life into him and topped the Cradley scorers at the end of May against Swindon with 13 points. He was soon back into the main body of the team with Greg dropping down in June. He top scored at Bradford with 13 again at the end of July. Continuing his form up to September when he was selected for the Danish World Team Cup Team at reserve when Erik's first heat crash forced him into the team scoring 9 points but he was so upset he considered retiring but his next meeting turned out to be the biggest of his career winning the Under 21 Final in Lonigo Italy. 1990 should have been the year that Gert reached the top but failed to turn up with the goods and his average dipped by almost a point a match though he improved towards the end of the season to get his call-up for 1991. He had a better year up until September when a knee injury cut short his season and the Heathens were left to struggle on. Gert's highest point came in 1992, he started slowly but scored an 18 point max against Bradford in June but then broke his jaw at Reading a few weeks later. After a short time out he returned to crash at Arena Essex and missed another couple of matches but in between managed to become Danish Champion and win the Austrian semi-final with a 15 point max! In the World Final Gert shocked everyone by finishing in third place. 1993 was Gert's final year in British Speedway he was inconsistent and some times rode like the World number three, other times he struggled and his average dipped yet again.